The story of Oregon Hot Tub begins in April 1979, when the company’s founder began installing a variety of wooden hot tubs and in-ground fiberglass spas and opened a retail store in Beaverton. Oregon Hot Tub is Oregon’s largest and most established hot tub company—the #1 selling hot tub company in the Portland-area since 1979. We carry only the most innovative and best-in-market products at our seven convenient locations. Before you buy, our friendly and knowledgeable sales team will ensure that you are getting the hot tub or sauna that’s the right fit for you. Each customer is treated as an individual with individual needs. No product is one-size-fits-all. After you buy, our certified technicians, water care specialists, and customer service representatives provide the best post-purchase service in the industry. There’s nothing like slipping into a Marquis Hot Tub at the end of the day. The warm water and pulsating jets help you relax and sleep better. Imagine slipping into the warm, steamy water of your very own Marquis Hot Tub each and every night. Just 15 minutes of hydrotherapy helps you relax and let the stress of the day melt away. The friendly staff at Marquis Hot Tub are experts in the hot tub field and can offer tips, advice, and an unmatched base of knowledge. At Marquis Hot Tub, we are employee-owned, which means everyone has a vested interest in the quality and service that you receive. Our hot tubs are proudly manufactured in Oregon by fellow employee-owners, and it really shows when you see the quality, fit, and finish of the spas we produce. We encourage you to stop in to one of our stores and see the Marquis Hot Tub difference. We are a locally and family owned Coast Spas dealer with excellent customer service. At Spa-Logic we offer the highest quality hot tubs. At West Coast Spas in Beaverton, Oregon we offer quality hot tubs for great prices. We are a locally owned, Oregon based manufacturer, with components made in the USA! From 2 person “soaker” tubs to 16ft swim spas for aspiring Olympians, we have 15 models to fit any lifestyles! In 2011, West Coast Spas purchased one of the oldest spa manufacturing facility in Oregon. We are a family owned and operated company distributing hot tubs throughout Oregon and Western North America. We manufacture our spas in Oregon’s beautiful Willamette Valley and have 4 Portland Area showrooms. Our mission is to deliver high quality spas, built to order in our factory, for you. We offer many options so you can create a unique spa tailored to your needs and tastes. The therapeutic benefits that spa owners enjoy are vast. From physical to emotional stress relief, alleviating muscle pain to relief for arthritis, a hydrotherapy spa can bring your health into focus. It’s important that you do some research before visiting a local Tigard spa and hot tub dealer. While they can give you lots of information about features and financing, you should have an idea of where you would like to position your spa and what its main function will be. Do you plan to use it mostly for relaxation or socialization? How many people will be using it? All of these things will help the hot tub dealer pick the best models for you. Decide who will be responsible for daily maintenance in your household and if the extra energy costs are something you’re actually willing to incur. Also, know that most hot tub stores in Tigard, OR let you do test soaks, also known as a “wet test”, where you can throw on your suit and take each model for a spin in the showroom so you know exactly how they feel before purchasing. Don’t be shy — just think of it as test driving a car! 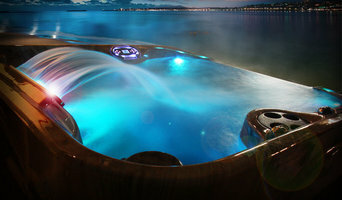 Find spa and hot tub dealers in Tigard, OR on Houzz. Narrow your search in the Professionals section of the website to hot tub and spa dealers in Tigard, OR. You may also look through photos to find hot tub designs you like, and ask about the details of the spa, including the manufacturer and where it was was purchased.